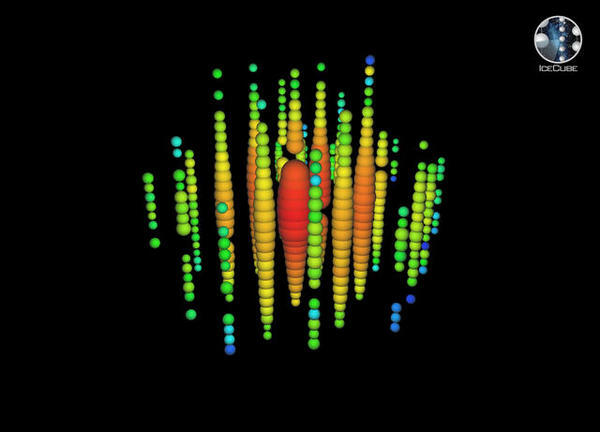 Today, the IceCube Collaboration announces a new observation of high-energy neutrinos that originated beyond our solar system. This study, which looked for neutrinos coming from the Northern Hemisphere, confirms their cosmic origin as well as the presence of extragalactic neutrinos and the intensity of the neutrino rate. The first evidence for astrophysical neutrinos was announced by the collaboration in November 2013. The results published now in Physical Review Letters are the first independent confirmation of this discovery. Neutrinos are subatomic particles that travel throughout the universe almost undisturbed by matter, pointing directly to the sources where they were created. And for the highest energy neutrinos, those sources are expected to be the most extreme environments in the universe: powerful cosmic generators, such as black holes or massive exploding stars, that are able to accelerate cosmic rays to energies over a million times the energies achieved by record-breaking human-made accelerators, such as the LHC at CERN. Neutrinos are never directly observed, but IceCube is able to see the by-products of a neutrino interaction with the Antarctic ice. This cubic-kilometer detector records a hundred thousand neutrinos every year, most of them produced by the interaction of cosmic rays with the Earth’s atmosphere. 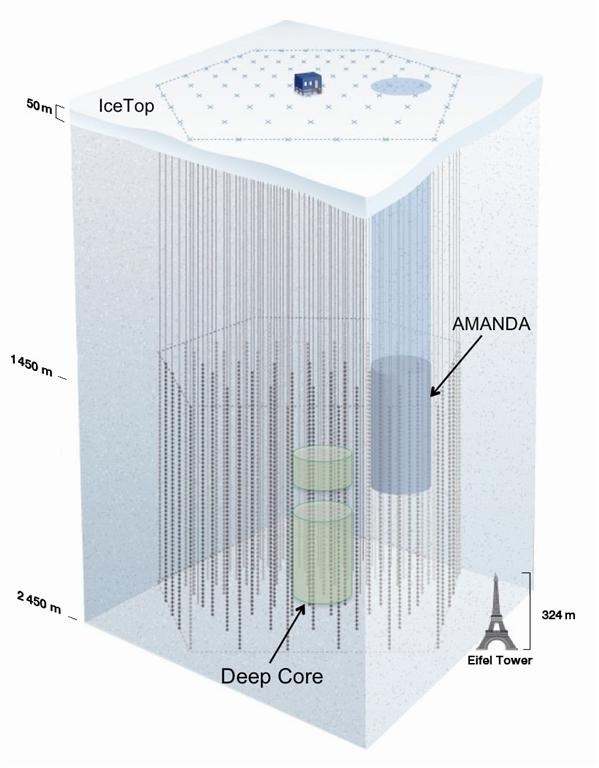 Billions of atmospheric muons created in the same interactions also leave traces in IceCube. And from all of these, researchers are looking for only a few dozen astrophysical neutrinos, which will expand our current understanding of the universe. The search presented today by the IceCube Collaboration uses an old strategy for a neutrino telescope: it looks at the universe through the Earth, using our planet to filter the large background of atmospheric muons. More than 35,000 neutrinos were found in data recorded between May 2010 and May 2012. At the highest energy, above 100 TeV, the measured rate cannot be explained by neutrinos produced in the Earth’s atmosphere, indicating the astrophysical nature of high-energy neutrinos. The analysis presented in this paper suggests that more than half of the 21 neutrinos above 100 TeV are of cosmic origin. This independent observation, with a significance of 3.7 sigma and in good agreement with previous results by the IceCube Collaboration, also confirms the high rate of astrophysical neutrinos. Even though scientists are still counting them by the handful, IceCube results are close to the maximum rates based on potential cosmic ray sources. The intensity of this flux shows that cosmic ray sources are also efficient generators of neutrinos. And, therefore, these tiny particles are further endorsed as the perfect tools to explore the extreme universe. 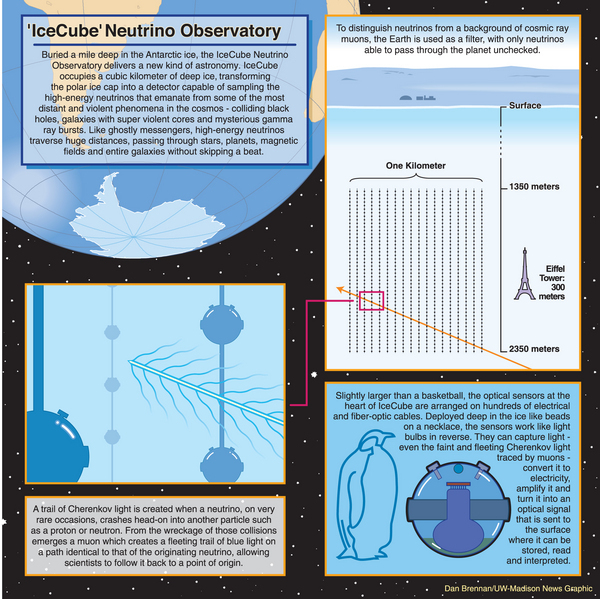 The observed high-energy neutrinos are a brand-new neutrino sample, with only one event in common with the first results announced in 2013, which searched for high-energy neutrinos that had interacted with the ice inside IceCube during the same data-taking period. The current search looked for muon neutrinos only. These neutrinos produce a muon when they interact with the ice and have a characteristic signature in IceCube, called a track, that makes them easy to identify. The same shape is expected for an atmospheric muon, but by looking only at the Northern Hemisphere, researchers know that a detected muon could have only been produced by a neutrino interaction. These neutrino-induced tracks have a very good pointing resolution, in which they can locate their sources within less than a degree. However, IceCube’s studies have not yet found a significant number of neutrinos coming from any single source. The neutrino flux measured by IceCube in the Northern Hemisphere has the same intensity as the astrophysical flux in the Southern Hemisphere. This adds support to a large population of extragalactic sources, since otherwise sources in the Milky Way would dominate the flux around the galactic plane. In addition, this new high-energy neutrino sample, when combined with previous IceCube measurements, allows the most accurate measurements to date of the energy spectrum and neutrino-type composition of the extraterrestrial neutrino flux. Those results are published in an accompanying paper in The Astrophysical Journal. IceCube, run by the international IceCube Collaboration and headquartered at the Wisconsin IceCube Particle Astrophysics Center (WIPAC) at UW–Madison, is a gigaton particle detector located near the Amundsen-Scott South Pole Station, one of the scientific facilities in Antarctica managed by NSF. It is buried beneath the surface, extending to a depth of about 2,500 meters. A surface array, IceTop, and a denser inner subdetector, DeepCore, significantly enhance the capabilities of the observatory, making it a multipurpose facility. The IceCube Neutrino Observatory was built under an NSF Major Research Equipment and Facilities Construction grant, with assistance from partner funding agencies around the world. The NSF’s Division of Polar Programs and Physics Division continue to support the project with a Maintenance and Operations grant, along with international support from participating institutions and their funding agencies. UW–Madison is the lead institution, and the international collaboration includes 300 physicists and engineers from the U.S., Germany, Sweden, Belgium, Switzerland, Japan, Canada, New Zealand, Australia, U.K., Korea and Denmark. + info Evidence for Astrophysical Muon Neutrinos from the Northern Sky with IceCube, IceCube Collaboration: M.G. Aartsen et al. Physical Review Letters 115, 081102 (2015). When they looked at their data, they sent an alert to scientists working on the HAWC Gamma-Ray Observatory, an array that collects gamma-ray data from a large range of the sky over time. Scientists have already looked through HAWC 2014 data for an associated gamma-ray signal, says gamma-ray scientist Werner Hofmann of the Max Planck Institute for Nuclear Physics in Germany. Since the first detection of neutrinos with PeV energies, IceCube researchers have performed several follow-up studies to investigate the nature of the astrophysical neutrino flux. These analyses have revealed, for instance, that this flux extends down to energies around 25 TeV and that it displays different event topologies. The IceCube Collaboration is now revisiting these results in a combined analysis accepted for publication in The Astrophysical Journal. The analysis is based on the results of six individual studies and uses up to three observables—energy, zenith angle and event topology—to derive improved constraints on the energy spectrum and the composition of neutrino flavors (νe , νμ , ντ) of the astrophysical neutrino flux. The current study shows that the energy spectrum of the astrophysical neutrino flux is well described by a power law with a best-fit spectral index of -2.50 ± 0.09, for energies between 25 TeV and 2.8 PeV. A continuous power-law spectrum with index -2, which is a popular benchmark model, is excluded with a significance of 3.8 sigma. Energy spectrum of the astrophysical neutrino flux derived in the combined analysis (red shaded area). The blue shaded area shows the flux of neutrinos created in the decay of pions and kaons in the atmosphere; the green line is an upper limit on the flux of so-called prompt atmospheric neutrinos from the decay of charmed mesons. Image: IceCube Collaboration. The combined analysis benefits from an increased size of the event sample, which is also more diverse—including track-like as well as shower-like events. Tracks are produced by most interactions of muon neutrinos, in which long-range muons are produced. On the other hand, interactions of electron and tau neutrinos, as well as some muon neutrinos, give rise to shower-like events. “With this study, we are able to present the first comprehensive characterization of the astrophysical neutrino flux at IceCube,” explains Lars Mohrmann, an IceCube researcher at DESY in Zeuthen and corresponding author of the paper. The flavor composition of the astrophysical neutrino flux brings us information about the production mechanism and the properties of the neutrino sources. In many scenarios, neutrinos are produced in the decay of pions, which create one electron neutrino per every two muon neutrinos and no tau neutrinos (νe : νμ : ντ =1:2:0). Because neutrinos switch flavors during their long journey through the universe, the 3-flavor composition at Earth is expected to be approximately even (≈1:1:1). The constraints on the flavor composition derived with this study show that the data are compatible with this scenario as well as with the sole production of muon neutrinos (0:1:0). In another mechanism, astrophysical neutrinos are produced in the decay of neutrons whereby only electron neutrinos are produced (1:0:0). However, this scenario is excluded with a significance of 3.6 sigma. Constraints on the flavor composition of the astrophysical neutrino flux. Each of the three axes displays the fraction of a particular neutrino flavor with respect to the total flux. The best-fit composition is marked with X. Image: IceCube Collaboration. 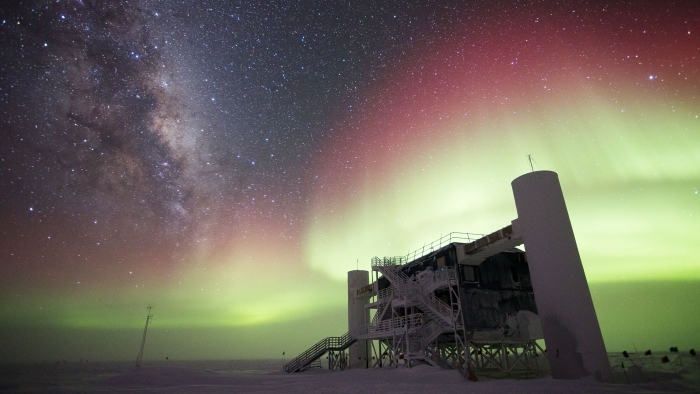 The South Pole observatory IceCube has recorded evidence that elusive elementary particles called neutrinos changing their identity as they travel through the Earth and its atmosphere. The observation of these neutrino oscillations, first announced in 1998 by the Super Kamiokande experiment in Japan, opens up new possibilities for particle physics with the Antarctic telescope that was originally designed to detect neutrinos from faraway sources in the cosmos. “IceCube records over one hundred thousand atmospheric neutrinos every year, most of them muon neutrinos produced by the interaction of fast cosmic particles with the atmosphere,” says Rolf Nahnhauer, leading scientist at DESY. The subdetector DeepCore allows for detecting neutrinos with energies down to 10 giga-electronvolts (GeV). “According to our understanding of neutrino oscillations, IceCube should see fewer muon neutrinos at energies around 25 GeV that reach IceCube after crossing the entire Earth,” explains Rolf Nahnhauer. “The reason for these missing muon neutrinos is that they oscillate into other types.” IceCube researchers selected Northern Hemisphere muon neutrino candidates with energies between a few GeV and around 50 GeV from data taken between May 2011 and April 2014. About 5200 events were found, much below the 7000 expected in the non-oscillations scenario. The strength of the oscillation and the distances over which it develops depend on two parameters: the so-called mixing angle and the mass difference. The values of these parameters have been constrained by precise measurements of neutrinos from the sun, the atmosphere, nuclear reactors, and particle accelerators. The IceCube neutrino observatory at the South Pole has already demonstrated that it is a powerful tool to explore the universe by neutrinos, using the Antarctic ice sheet as its detection material. An array of more than 5000 optical sensors distributed in a cubic kilometer of the ice records the very rare collisions of neutrinos. And less than two years ago, IceCube physicists announced the discovery of the first high-energy neutrinos from the cosmos, acknowledged as “breakthrough of the year” by the journal Physics World. Three years of IceCube data yielded a similar precision to that reached from about 15 years of Super-Kamiokande data. In contrast to the purified water in Super-Kamiokande’s 50-kiloton vessel, IceCube uses a natural target material, the glacier ice at the South Pole. IceCube’s 500 times larger observation volume produces larger event statistics in shorter times. “Both Super-Kamiokande and IceCube use the same ‘beam‘ which is atmospheric neutrinos, but at different energies. And we reach similar precision of the measurable oscillation parameters,” says Juan Pablo Yanez, postdoctoral researcher at DESY, who is the corresponding author of the paper. “The results now derived from IceCube data show errors still larger than, but already comparable to the most precise neutrino beam experiments MINOS and T2K. But as IceCube keeps taking data and improving the analyses we are hopeful to catch up soon.” adds Yanez. Gamma-ray bursts (GRBs) were once the most promising candidate source of ultra-high-energy cosmic rays (UHECRs). They release extremely large amounts of energy in short periods of time, so if they could accelerate protons as they do electrons, then GRBs could account for most of the observed UHECRs. But along comes IceCube, the first gigaton neutrino detector ever built, ready to dig into the origin of UHECRs using neutrinos. There’s a whole universe in which to look for a signal but, to test GRBs as possible sources, they started with a search for neutrinos in coincidence with observed GBRs. Previous results, published by the IceCube Collaboration in 2012 in Nature, found no such coincidence. This cast doubt on GRBs as the main source of UHECRs. In a follow-up study submitted today to the Astrophysical Journal Letters, the collaboration shows that the contribution of GRBs to the observed astrophysical neutrino flux cannot be larger than about 1%. The study also sets the most stringent limits yet on GRB neutrino production, excluding much of the parameter space for the most popular models. The collaboration is now also providing a tool to set limits on other GRB models using IceCube data. One may wonder how observing neutrinos in Antarctic ice tells us anything about cosmic rays and GRBs. The answer is simple, if you ask a physicist: neutrinos are an unambiguous signature of proton acceleration. And cosmic rays are, in their vast majority, very high energy protons. That cosmic rays exist at energies up to 10^20 eV is a fact; we have observed them with all sort of detectors since their discovery by Victor [Francis] Hess back in 1912. Physicists have developed several models that could explain how and where cosmic rays can be accelerated to such extreme energies. All of these models also tell us that any cosmic proton accelerator that we can imagine would also be a very high energy neutrino generator. While cosmic rays are scrambled by intergalactic magnetic fields, neutrinos travel in straight paths, potentially allowing us to identify their sources. For this reason, the search for the sources of cosmic rays has also become the search for very high energy neutrinos. IceCube, the first detector to measure a very high energy neutrino flux, is now squeezing every bit of information out of its data, to learn more about the origins of those neutrinos and thus of cosmic rays. In the current research, IceCube has looked for a neutrino signature in coincidence with over 500 GRBs observed during the data-taking period from April 2008 to May 2012. A single low-significance neutrino was found, confirming previous results by the collaboration. However, this data sample was much larger, including the first data from the completed detector and allowing still more stringent limits on GRB neutrino production. GRBs were once very promising candidates for the source of UHECRs. Corresponding author Michael Richman from University of Maryland notes that “using data taken from one year of operation of the completed detector, IceCube has already cast doubt on that hypothesis.” IceCube’s recent observation of an astrophysical neutrino flux marks a new era of neutrino astronomy. This flux is compatible with the expectation from cosmic ray production. While GRBs are excluded as dominant sources of either UHECRs or the diffuse astrophysical neutrinos, ongoing analyses will shed new light on these mysterious signals. The IceCube Neutrino Observatory is a successful and large scientific facility located near the Amundsen-Scott South Pole station in Antarctica. This observatory hosts IceCube, a cubic-kilometer deep-ice particle detector that is, so far, the largest ever built – and on the surface, IceTop, an extended air shower array. Completed in 2010, IceCube has recently discovered astrophysical neutrinos, revealing their potential to explore our universe at energies at the PeV scale and above, where most of the universe is opaque to high-energy photons. But the big questions remain unsolved: where do these neutrinos come from? How does nature accelerate particles to such extreme energies? Prof. Olga Botner, IceCube spokesperson and a physics professor at the University of Uppsala, and Prof. Francis Halzen, IceCube principal investigator and a professor at the University of Wisconsin–Madison, tell us about the plans for an upgrade to the IceCube Neutrino Observatory. As an extension of the current detector, it can be built in a few years and within an affordable budget, thanks to expertise acquired with IceCube. Q: What has IceCube accomplished so far? Olga Botner (O): IceCube is the world’s foremost neutrino observatory, which, after just two years of running in its final configuration, discovered neutrinos from outer space that have energies a billion times larger than those of neutrinos produced by our Sun and a thousand times larger than any produced on Earth with man-made accelerators. The discovery of this high-energy neutrino flux is a turning point for neutrino astronomy: a dream of 50 years ago on the verge of becoming reality. Francis Halzen (F): The high level of the observed neutrino flux implies that a significant fraction of the energy in the non-thermal universe, powered by the gravitational energy of compact objects from neutron stars to supermassive black holes, is generated in hadronic accelerators. This tells us that we are approaching exciting times when high-energy neutrinos will reveal new sources or provide new insight on the energy generation in known sources. But IceCube has also been a successful detector with respect to its technical development. We developed highly successful designs for transforming natural ice into a particle detector. The optimized methods for deploying and commissioning large volume detectors in ice can be used for a next-generation detector; minimal modifications will target improvements focused on modernization, efficiency, and cost savings. O: This is a very important point. The detector was built within the expected time frame, within budget, and with a performance at least a factor of two better than anticipated. Going back to physics, I should also add that IceCube has yielded many interesting results beyond neutrino astronomy. We are studying cosmic rays, looking for signatures of the annihilations of dark matter particles into neutrinos, and investigating the properties of the neutrinos themselves. We have published competitive results in all these areas. Q: Why do we need a next-generation IceCube detector? F: We all agree on the observed spectrum of neutrinos, there’s no doubt about the discovery, but independent analyses of IceCube data have produced only on the order of 100 astrophysical neutrino events in several years. These modest numbers of cosmic neutrinos limit the ability of IceCube to be an efficient tool for neutrino astronomy over the next decade. A next-generation detector will provide an unprecedented view of the high-energy universe, taking neutrino astronomy to new levels of discovery. 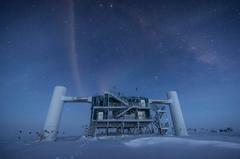 It is likely to resolve the question of the origin of the cosmic neutrinos recently discovered. O: That’s right! IceCube’s discovery of extraterrestrial neutrinos has shown us that even a cubic-kilometer detector is not enough. To fully exploit the potential for neutrino astronomy, a much larger observatory is needed. We are already working on its design. The new detector has been named IceCube-Gen2. Q: Is it feasible and cost-effective to build an even bigger detector at the Pole? O: It sure is. The good news is that the successful deployment and running of IceCube demonstrates that we have mastered the technologies to construct and operate a detector in the deep ice. The drilling systems and the optical modules for the next-generation detector will closely follow the designs that have been proven to work well—with certain modifications to improve the overall performance. This makes us confident that a next-generation detector is not only feasible but can be built in a cost-effective manner, just like IceCube. F: We didn’t know this before IceCube, but now we have measured the extremely long photon absorption lengths in ice. 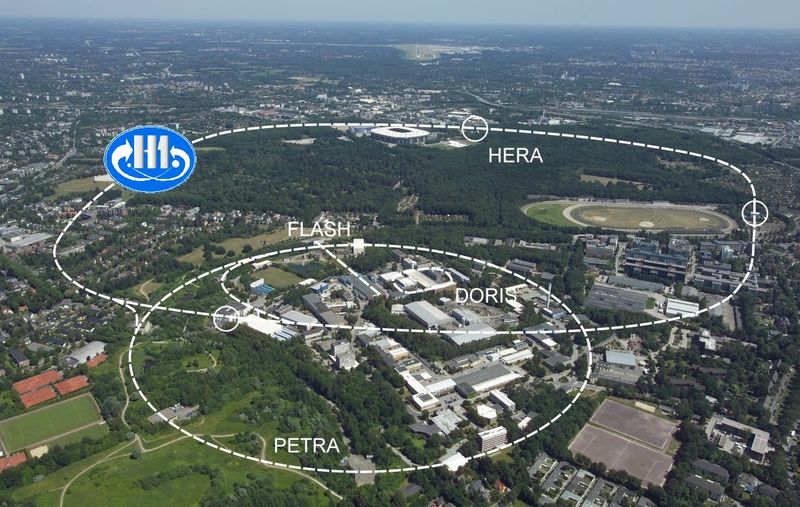 This will allow the spacing between strings of light sensors to exceed 250 m in a future IceCube extension; i.e., the instrumented volume can rapidly grow without increasing the costs much. In fact, we can build a ten-cubic-kilometer IceCube-Gen2 telescope by roughly doubling the instrumentation already deployed. Thus, a tenfold increase in astrophysical neutrino detection rates could be achieved with a cost comparable to the current IceCube detector. Q: And what about the time scale of this project? Will we need to wait a long time to see new results? O: We are aiming at an expanded array instrumenting a volume of 10 km3 for the detection of high-energy neutrinos—but also at improving the low-energy performance through deployment of a densely instrumented infill detector, PINGU, targeting neutrino mass hierarchy as its prime goal. We believe that this new IceCube-Gen2 observatory can be built within seven years of obtaining funding. Q: Sounds like a plan. Who is leading this next-generation IceCube? F: The present plan is to build IceCube following a management strategy that was successful in delivering IceCube on time and on budget. The collaboration is rapidly expanding, both in the US and in Europe and Canada. We expect that a larger fraction of the cost will be carried by significant contributions from our foreign collaborators. O: Exactly. The high-energy array and PINGU are both envisioned as parts of an IceCube-Gen2 observatory. A new collaboration, including IceCube members and additional institutions, is now being formed. This IceCube-Gen2 collaboration will work to develop proposals in the US and abroad to secure funding. We hope that IceCube-Gen2 will become a flagship scientific project for NSF as well as for funding agencies abroad. Q: Can other current or in-design experiments do better than IceCube-Gen2? F: Well, we have strong competitors. Early efforts for cubic-kilometer neutrino detectors focused on deep-water-based detectors, including DUMAND, Lake Baikal, and ANTARES. So far, there is no cubic-kilometer neutrino detector in deep water, but these experiments have paved the way toward the proposed construction of KM3NeT in the Mediterranean Sea and GVD in Lake Baikal. O: These new projects, GVD in Lake Baikal and KM3NeT in the Mediterranean, are presently in the prototyping or early construction phase. They will eventually provide a complementary view of the sky to that of an Antarctic observatory. Q: Should we expect IceCube-Gen2 to be as successful as IceCube? That may be the desire, but are there objective reasons to think so? O: The main one is that we already have established the existence of a flux of high-energy neutrinos. What we now need are substantial number of events to further characterize this flux in terms of energy spectrum, a possible energy cut-off, flavor composition, and provenance. We just need a larger detector to do this in a reasonable time. The higher event rates in a larger array will also improve the chances of correlating our neutrino events with observations by the new generation of high-energy gamma-ray telescopes and gravitational wave detectors, together charting the non-thermal universe. F: The larger samples of high-energy neutrinos with improved angular resolution and energy measurement will give us a detailed understanding of the source distribution. This sample will reveal an unobstructed view of the universe at energies at PeV and above. Those are unexplored wavelengths where most of the universe is opaque to high-energy photons. As Olga was mentioning, the operation of IceCube-Gen2 in coincidence with other telescopes and detectors will present totally novel opportunities for multimessenger astronomy and multiwavelength follow-up campaigns to obtain a truly complete picture of astrophysical sources. This white paper presents early studies toward a next-generation IceCube detector with the aim of instrumenting a 10 km3 volume of clear glacial ice at the South Pole and delivering an order of magnitude increase in astrophysical neutrino samples of all flavors. Building a cubic-kilometer telescope at the South Pole seemed a chimera even for some of those involved in the project. But AMANDA had proven that if such a detector were built, it would allow great science to come. The goal was simple in words but seemingly impossible in practice: 86 boreholes, each 60 cm in diameter and 2,500 m deep, had to be drilled and instrumented in seven austral summer seasons. Safety was a must, fuel needed to be used cautiously and the South Pole environment was just unavoidable. And yet, IceCube was completed in the seventh construction season. By that time, at the end of 2010, the IceCube drilling team had beaten all records: less time and fuel per borehole, optimized hole shapes with almost perfect vertical alignment over the 2.5-km depth, and only a few safety-related issues. How was this possible? Blame the talent, expertise and strong will of a great team. Some of the crew at the South Pole during the last drill season for IceCube. From left to right, Hanna Blomstrom, an anonymous IceCube collaborator, Matt Newcomb, Dennis Dulling, Terry Benson, Richard Wipperfurth, Jim Haugen and Sven Lindstrom. Image: Jim Haugen. IceCube/NSF. Four years after IceCube’s completion and with new projects and drilling seasons on the horizon, the team that led this feat has explained the details of IceCube drilling in two papers published today in the journal Annals of Glaciology. “Although there was a lot of experience from AMANDA drilling, drilling for IceCube was a whole new ballgame. We continued learning lessons about the equipment and our techniques to the bitter end, but by the final seasons the drill and its crew were a well-oiled machine,” explains Terry Benson, a drill engineer at the Physical Sciences Laboratory (PSL), who started working on the IceCube drill as a young student and was one of the drill leaders during the last two construction seasons. “It would have been impossible to build IceCube without PSL. With them, we overcame every challenge and the results were impressive,” says Prof. Albrecht Karle, the IceCube associate director for Science and Instrumentation. Drilling to depths that almost reach the Antarctic bedrock also meant a larger diameter for the holes, since water starts to freeze immediately. And working at the South Pole meant that logistics and resources had to be extremely well planned and economized. “It was important to conserve the expensive fuel so we wanted to avoid overdrilling the holes. However, if a hole was made slightly too small, so that a string got stuck, both the hole and the string of instrumentation could be be lost. This would have been a very expensive mistake. It was extremely important to have a good understanding of hole size and freeze back rate,” explains Lee Greenler, a mechanical engineer also at PSL, who led the team developing the heat transfer calculations that allowed the optimization of the drilling process. Image from the last IceCube drilling season at the South Pole. On the left, the hose reel for the over 2,500 meters long hose used to drill the IceCube holes. Image: Jim Haugen. IceCube/NSF. The drilling process started with four weeks of preparation and a crew of about 30 people. The seasonal equipment site (SES), which provided electricity and a stable supply of hot pressurized water, and the tower operations site (TOS) had to be excavated and commissioned. The SES remained stationary throughout each drill season, while drilling towers moved from one hole to another. “We were drilling around-the-clock, with three 9-hours shifts and only Sundays off. In season 2009-2010, when we drilled 20 holes, we sent 88 people to the Pole, but also over 450,000 liters of fuel and almost 300 tons of cargo,” explains Jim Haugen, an instrumentation engineering manager at WIPAC, who has been leading the logistics of the IceCube polar seasons since construction began. Drilling an IceCube hole meant shooting hot water at 80ºC through an instrumented drill head at the end of a continuous hose of about 2,500 meters. Then, during the ream phase, the drill was raised while the hot water continued to flow, enlarging the hole and keeping non-frozen water in contact with the hole walls so that it took longer to freeze back. Once 60 IceCube sensors (DOMs) were deployed, the hole completely froze around them over the following week or so. An independent firn drill was used for the first 50 meters, since this first layer of lower density snow does not hold water. This improved system, designed after the first seasons proved the old firn drill to be very slow, allowed an increase from 13 to 18 or more holes drilled per season. Image from the last IceCube drilling season at the South Pole. Two drill towers were deployed to allow continuous drilling. On the front, one of the IceTop tanks. Image: Jim Haugen. IceCube/NSF. To drill IceCube was not an easy job, but the results now presented in these two papers show that it is possible to do large-scale production ice drilling in the Antarctic environment in a safe, efficient and predictable way. Dynamic engineering techniques based on year-to-year lessons learned and on retention of experienced crew members were critical in turning a chimera into the successful IceCube Neutrino Observatory. IceCube Enhanced Hot Water Drill functional description, T. Benson, J. Cherwinka, M. Duvernois, A. Elcheikh, F. Feyzi, L. Greenler, J. Haugen, A. Karle, M. Mulligan, R. Paulos. Annals of Glaciology 55(68) (2014) 105-114. doi:10.3189/2014AoG68A032. Modeling hole size, lifetime and fuel consumption in hot-water ice drilling, L. Greenler, T. Benson, J. Cherwinka, A. Elcheikh, F. Feyzi, A. Karle, R. Paulos. Annals of Glaciology 55(68) (2014) 115-123. doi:10.3189/2014AoG68A033. A search for neutrino interactions inside IceCube brought evidence of an extraterrestrial neutrino flux. Now the IceCube Collaboration has expanded the search, lowering the range of deposited energy down to 1 TeV. The goal was a better understanding of the different contributions to the neutrino flux in IceCube and hopefully to measure the charmed-meson component for the first time. The results of this study, submitted today to Physical Review D, have again proven neutrinos from charmed-meson decays to be elusive. The good news is the results set a more stringent upper limit on their contribution, only 1.52 times the theoretical benchmark prediction used in previous IceCube analyses. IceCube researchers have also derived new constraints on the diffuse astrophysical neutrino spectrum, . High-energy neutrinos may be produced either by the interaction of cosmic rays in the Earth’s atmosphere, the so-called atmospheric neutrinos, or in the vicinity of distant astrophysical accelerators like black holes and neutron stars, the so-called astrophysical neutrinos. Whether atmospheric or astrophysical, neutrinos come in different flavors, but their rates and their energy and direction distributions can help us distinguish the different contributions to the overall flux and learn more about their origins and production mechanisms. Atmospheric neutrinos are mainly muon neutrinos produced in 2-body decays of charged pions and kaons. The electron neutrino component is primarily due to 3-body decays of charged and neutral kaons. And there’s still a third contribution from the decays of heavy, short-lived mesons containing charm quarks, which create approximately the same amount of muon and electron neutrinos. However, this third prompt contribution has never been conclusively observed. Astrophysical neutrinos, which may have been created by diffusive shock acceleration in the vicinity of cosmic ray sources, will arrive to Earth with an equal ratio for the three flavors (muon, electron and tau neutrinos) and with an energy spectrum expected to follow that of the progenitor protons ( ). Thus, their flux will exceed that of atmospheric neutrinos at very high energies. The current search was looking for neutrino-induced interactions starting in the IceCube detector with energies between 1 TeV and beyond a few PeV, exploring for the first time the region between 10 and 100 TeV, where neutrinos from charmed-meson decays in the atmosphere should be observable. There were 388 events found in IceCube data from 2010-2012, which should include contributions from conventional and prompt atmospheric neutrinos, and extraterrestrial neutrinos, along with a small but nearly irreducible background of penetrating atmospheric muons that go undetected before depositing a large fraction of their energy in the glacial ice in a single, catastrophic loss. Table: Results for the best fit parameters and number of events attributable to each neutrino component. The best fit of each of these contributions to the observed neutrino flux in IceCube shows a good agreement with previous results, except in the region around 30 TeV in the southern sky (see figure and table above) where an extra component might be required to account for the observed events. The spectral index for astrophysical neutrinos is larger than 2.2, which may be a hint for a galactic neutrino component of this flux. At higher energies, though, neutrinos from extragalactic sources would be the dominant ones. However, the best fit to this index hardens to 2.25 if the energy threshold is raised to 60 TeV, again an indication that we need more data to understand the neutrino flux with energies around 30 TeV in IceCube. The IceCube Laboratory at the Amundsen-Scott South Pole Station, in Antarctica, hosts the computers collecting raw data. Only events selected as interesting for physics studies are sent to UW–Madison, where they are prepared for use by any member of the IceCube Collaboration. “IceCube is a wonderful and unique astrophysical telescope — it is deployed deep in the Antarctic ice but looks over the entire universe, detecting neutrinos coming through the Earth from the northern skies, as well as from around the southern skies,” says Vladimir Papitashvili of the National Science Foundation (NSF) Division of Polar Programs. 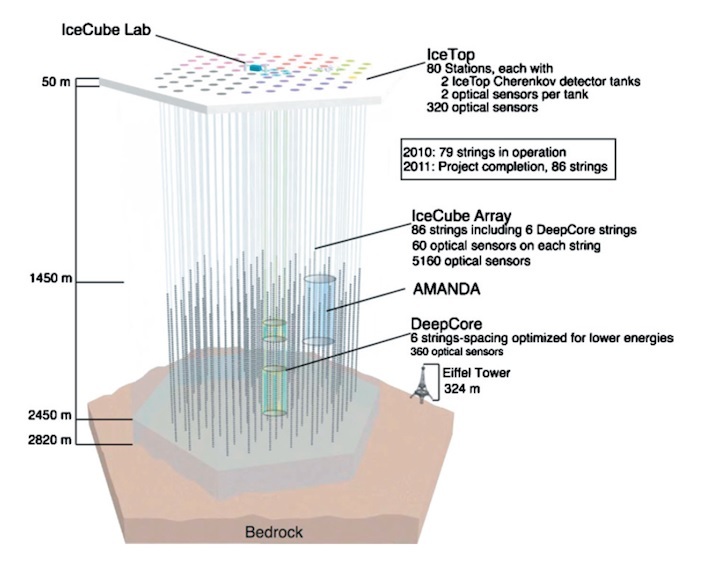 The IceCube Neutrino Observatory was built under a NSF Major Research Equipment and Facilities Construction grant, with assistance from partner funding agencies around the world. The NSF’s Division of Polar Programs and Physics Division continue to support the project with a Maintenance and Operations grant, along with international support from participating institutes and their funding agencies. UW–Madison is the lead institution, and the international collaboration includes 250 physicists and engineers from the U.S., Germany, Sweden, Belgium, Switzerland, Japan, Canada, New Zealand, Australia, U.K. and Korea. Neutrinoless double beta decay experiment in the Canfranc Underground Laboratory.